Hydrostation S — the world’s longest-running hydrographic time-series with a location offshore Bermuda — has received a commitment for another five years of support from the National Science Foundation [NSF]. The funding includes $900,000 for research and $3.1 million to support 120 days of research at sea on board the BIOS-operated research vessel Atlantic Explorer. In 1954, American oceanographer Henry Stommel at the Woods Hole Oceanographic Institution established the station 15 miles [25 kilometers] southeast of Bermuda. Known as Hydrostation S, Station S, or Panulirus Station, it became an accessible base for scientists to regularly measure and report on ocean salinity, temperature, and carbon dioxide from the surface and at a great depth, nearly two miles [3,200 meters]. Hydrostation S provides the longest record of the rate of natural and human-caused change to ocean warming, including impacts on salinity, marine life, and oxygen content. “If we care about how we are altering the planet, we have to care about long time series like Hydrostation S, which provide a meaningful history,” said chemical oceanographer and professor Nicholas Bates, a senior scientist at BIOS and a lead investigator on the project with BIOS assistant scientist Rod Johnson. Hydrostation S “has proved to be a great success in providing insight on ocean variability and all involved are respectful for the efforts of past science teams, as well as continued support from BIOS,” said Johnson, who has guided Hydrostation S over the past 25 years and, since 1988, has participated on many of the research cruises. This next round of NSF funding support will allow researchers to develop more sophisticated computer models of the water column at Hydrostation S, providing detailed and accurate forecasts of ocean circulation and accurate descriptions of climate change. Bates said the research will also incorporate data from BIOS’s fleet of three autonomous underwater gliders, equipped with instruments that gather data while the gliders move up and down in the water. The renewed funding announcement comes three years after NSF awarded $14 million to continue to support work at another longer-term, neighboring time series called the Bermuda Atlantic Time–series Study [BATS]. Like Hydrostation S, scientists from around the world use BATS data to investigate a variety of topics, including ocean physics and biogeochemistry, the global carbon cycle, and the ocean’s response to climate change. 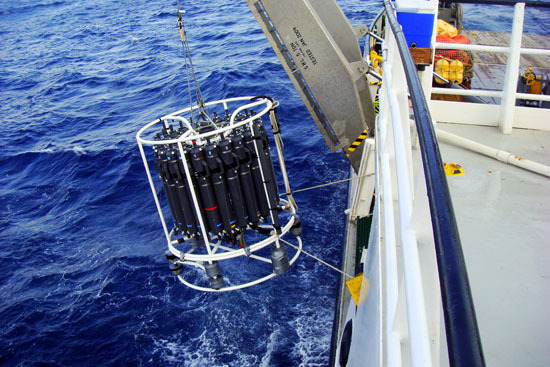 Bates called the renewed funding for Hydrostation S “an amazing long term window of observations into the changes of the open ocean.” He estimates that more than 500 papers have been published in scientific journals worldwide using data from Hydrostation S.
Research cruises to the study site also have played a large role in education at BIOS by providing members of the media and high school, undergraduate, and graduate students with one to two day trips to the Sargasso Sea for gaining experience and conducting independent research projects.